Beauty & All That: I'm in Love With Food! There is something about monthly Subscription boxes that I find intriguing.. Especially if it's a box of delightful snacks! At BlogHer 2013 earlier this month, I discovered the company Love With Food who graciously sent me a box for review. 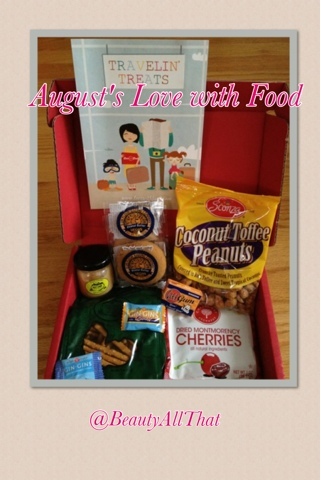 In this month's box, I snacked on vegan cookies, a snack pack of cherries, gingin (ginger) candied, glee natural gum, coconut toffee peanuts and pretzel sticks dipped in a lime mustard dip. 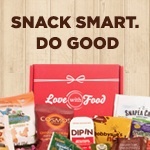 Love With Food carefully selects these products -only 10 bucks a month- and I can't wait to see next month's! Subscribe by 8/31/12 and save $2 off September's box with the code: BATVIP. Enjoy!